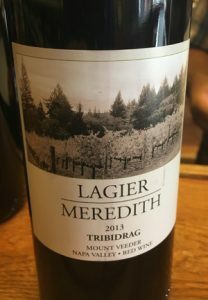 2013 Lagier Meredith, Tribidrag, Mount Veeder, Napa Valley. Steve Lagier and Carole Meredith are making some fantastic wines from their estate high up on Mount Veeder in Napa’s Mayacamas, the western mountains that separate the Napa Valley from the Sonoma side, and their Zinfandel a.k.a Tribidrag it’s original Croatian varietal name, is a stunner, fast becoming one of my absolute favorite Napa reds. Their Syrah is already legendary, but I adore this Tribidrag almost as much, it has lively mountain fruit and tannins with brambly spices and unique terroir charms that make it wonderfully intriguing and entertaining. While ripe and hedonistic with opulence and succulent dark fruit it has vital acidity, mineral notes and plenty of savory character with blackberry, plum, wild raspberry and blueberry fruits, flinty stones, briar notes, hints of cedar, anise and fresh cracked peppercorns. With air, floral essences emerge with violets and spring flowers, as well as earthy currant, fig and sage come through on the medium full palate that feels delightfully old school and lighter than the alcohol would suggest, in fact this is a sublime and elegant wine with lots to admire. If you want a rare expression of Zinfandel, you’re hard pressed to find a better or more fun wine, this wine has joined the elites of California’s top Zins, along with Bedrock, Ridge, Turley, Brown and Biale, be sure to look out for it and the rest of Steve and Carole’s lineup, the mentioned Syrah, and their Malbec are excellent as well, don’t miss them!